Our Designer Perfume Oils are 100% concentrated fragrance oils and are FREE OF ALCOHOL, ETHANOL, DILUTES OR FILLERS. We carry only top quality Designer Fragrances that have the same scent as the expensive designer brand perfumes, at a fraction of the cost. With Designer Brand Perfumes you are paying for the fancy bottle, their name, alcohol, ethanol and or water. Your fragrance evaporates within a short period of time taking the scent with it. 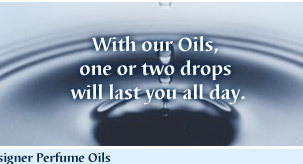 Worldwide Perfume Oils, Inc. requires a $100.00 minimum on all wholesale orders. To process your order, please provide us with your name and address, shipping address, phone number, your order and credit card number. Your order will be sent to you within 3-5 days after your information is received and confirmed. Shipping charges will be added to your total. Orders are shipped UPS, FedEx or US Mail. All duties and taxes are the responsibility of the customer. Please order a small amount for your testing needs as there are no exchanges or returns on wholesale orders. Free roll-on bottles or flip caps are not offered for wholesale orders. Our Designer Perfume Oils are called "TYPES" because the brand names are the exclusive property of their original manufacturer and are registered trademark names. We are not connected with the brand name in any way.